Founded 1949. Proudly Made in USA by Americans! We build them! World's first and largest manufacturer of Electric Staplers since 1949! 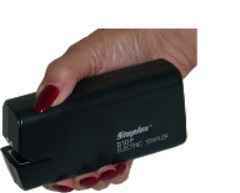 Staplex® S10P Hand Held Battery Stapler � Makes a great gift! Compact size and contoured shape makes it ideal wherever papers are stapled! 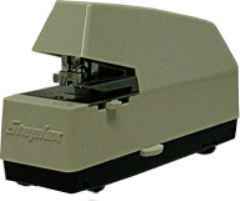 Staples up to 10 sheets of 20-lb. paper effortlessly and automatically � no pounding fists or squeezing! Operates while set on a desk or even more conveniently uniquely, while hand held! 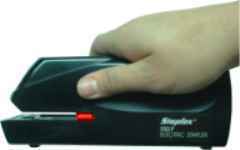 Staplex® S50P Hand Held Battery Stapler � Uses full tracks of standard size staples! Staples up to 20 sheets of 20-lb. paper effortlessly and automatically � no pounding fists or squeezing! 8,000 stapling cycles per new set of 6 "AA" alkaline batteries. AC Power Adapter also available. Uses Staplex® Type DS 1/4" leg High Speed Staples. Weighs only 2‑� lbs. (1 kg), is only 2" wide, 7‑�" deep and 4‑�" high (5 cm x 19 cm x 11 cm). Advanced trouble-free design�only 2 moving parts! Uses Staplex Type DS 1/4" leg High Speed Staples. Weighs only 1‑� lbs. (.7 kg), is only 2‑�" wide, 7-7/8" deep and 4-1/8" high (7 cm x 20 cm x 10.5 cm). The Staplex Company, Inc. All rights reserved. 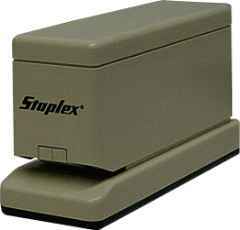 Staplex, the Staplex logo, AccuSlitter and the AccuSlitter logo, Tabster and the Tabster logo are registered trademarks of The Staplex Company, Inc. Patented and patent pending items. Specifications and availability subject to change without notice or obligation.